Breath Placement What is Breath Placement? “Breath Placement” is the place in the mouth where the singer aims and focusses the air creating resonance and a steady tone. If the air flow is unfocussed and moving around in the mouth, notes will waver and sound off pitch. This becomes more noticeable while singing steeper intervals. The singer wants to aim the air to the same place in the mouth and not sing, for example, from the back of the mouth to the front when going from a low note to a high note. There is a direct relationship between the positioning of the larynx and the placement of the air. Placing the air in the same point of the palate will assist the singer in keeping the larynx from chasing the pitch and it will make singing feel much easier. Balance is the key. Like surfing or skiing, when the breath is placed, and the air is focussed, the voice will glide and not teeter or wobble. 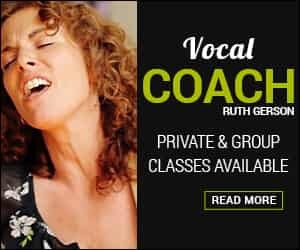 The vocal techniques of the Singingbelt System teaches vocalists to release an even, steady flow of air, and create a balanced tone. Think of the voice as a wind instrument. If you play the flute, you can see exactly where the aperture is and where the breath must be placed to create a tone. If the flutest were to release the breath unevenly into the aperture or were to move the breath back and forth over the aperture, the notes would waver and go off pitch. It is the same with the voice, only the air must be focussed inside the mouth and singers must do this by utilizing imagery and listening to the sound of the voice. The singer can imagine the air going straight up through the middle of the top of the head, or slightly back and up, and/or the air can be aimed forward, resonating in the cheeks, sinuses and forehead. All of this is correct. We find different resonances by aiming the air to different parts of the body. The most important aspect of breath placement is to focus on, especially for beginner vocalists, the breath going to the same place with every note for most of the vocal range. In the Singingbelt System, singers begin by aiming the air to the middle of the roof of the mouth, the “top of the dome,” where the soft palate and the hard ridge meet. For higher notes, the air is aimed slightly back into the soft palate, and for lower notes, the air is aimed towards the back of the upper front teeth. Breath support is needed for breath placement. To aim a steady, even breath, in one direction, a singer must learn breath support and control the air pressure that passes over the vocal cords for phonation. Proper breath support is necessary for proper placement. Breath support allows the singer to balance the air in one place in the mouth, which will keep notes from wavering, falling or being pushed off pitch. The singer must start by learning to control the diaphragm. Singing begins and ends with the breath. 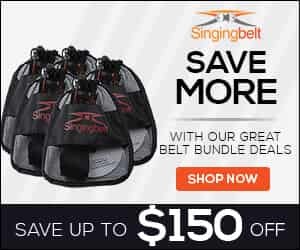 With use of the Singingbelt, the singer will be able to control the diaphragm and perfect placement.